Slowly sprinkle 1/2 tsp of baking soda into the tall glass containing the vinegar. You can dump it all in at once, but be ready for a big eruption! Let the reaction slow down until the foam has disappeared. Slowly tilt the tall glass on it’s side over the tea light as if you were pouring the air over it. 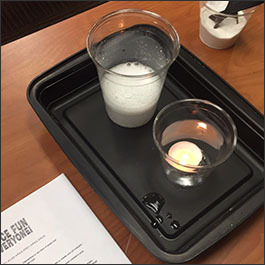 The baking soda/vinegar reaction results in a gas called Carbon Dioxide (CO2). CO2 is more dense than normal air, which means that it will sink! Because CO2 sinks, it stays in the cup instead of floating away like a normal mix of air would. This means you have a cup full of CO2! The candle burns thanks to a combustion reaction that requires Oxygen (O2), something we find in abundance in the air around us. When you pour your cup of CO2 into the cup containing the candle, the CO2 sinks to the bottom of the cup and surrounds the candle. This displaces (or pushes up) all the normally mixed air, along with all that O2 the fire needs to burn. And Voila! Your candle is extinguished invisibly!